Happy 125th Birthday, H. P. Lovecraft! 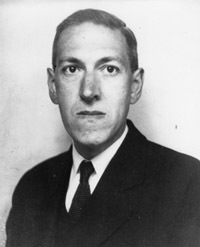 A very happy birthday to one of my greatest inspirations, weird horror writer and frequent user of the word unnameable, Howard Philips Lovecraft! In honour of this auspicious day, I have chosen to launch this new web-comic. Though, in fact, this little project has been in silent development for quite a long time now. 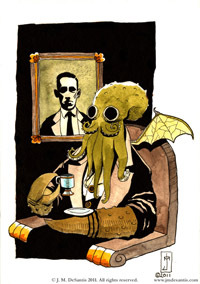 If you’ve seen me at a comic convention over the past few months and commented on my Cthulhu Taking Tea print, I may have said to you that I was considering making a web-comic based on the character in the piece. The truth is, I’ve been considering and developing the idea since as early as the Fall of 2014.